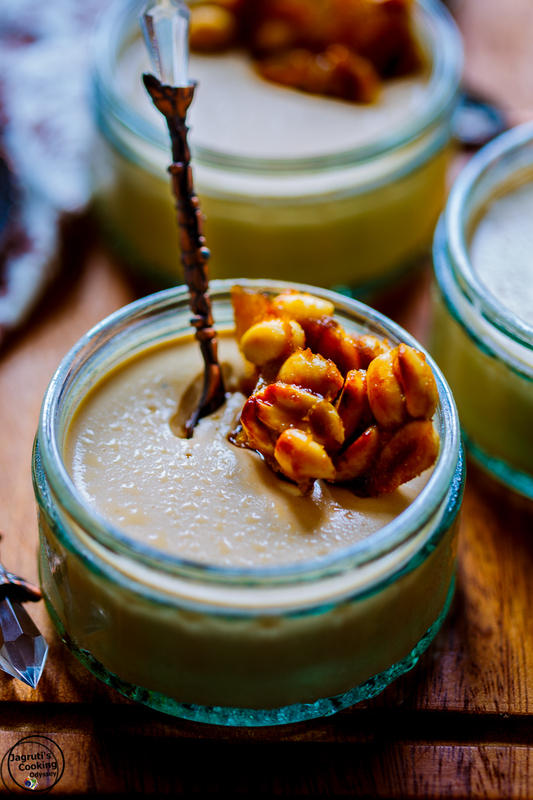 Serve this dreamy Vegetarian Caramel Panna Cotta with Salted Peanut Brittle dessert to your guests and prepare yourself for many compliments in return, just because you served them this unforgettable dessert which they can swoon over. A rich and elegant dessert for entertaining, simple and easy to prepare. It can also be made in advance and served when ready. 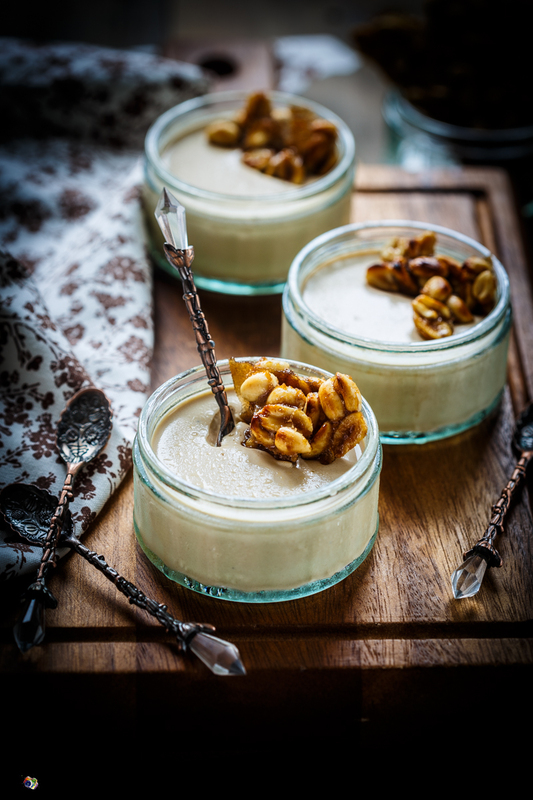 Combine together this caramel silky, smooth and sweet Panna Cotta with salted peanut brittle, for a dessert that can not be forgotten in a hurry. Being Indian in origin, I always fiddle with authentic recipes and turn those recipes into fusion recipes, or if I put it in posh words 'Modern Twist on the Traditional Recipes' and I prepared Thandai Panna Cotta with Rose Saffron jelly. and Doodh Poha with Nutella Panna Cotta. They were phenomenal! While I myself and daughter were preparing Paneer and Vegetable Makhni Dum Biryani we were left with almost 200-250ml cream. We had a short discussion on making Panna Cotta. 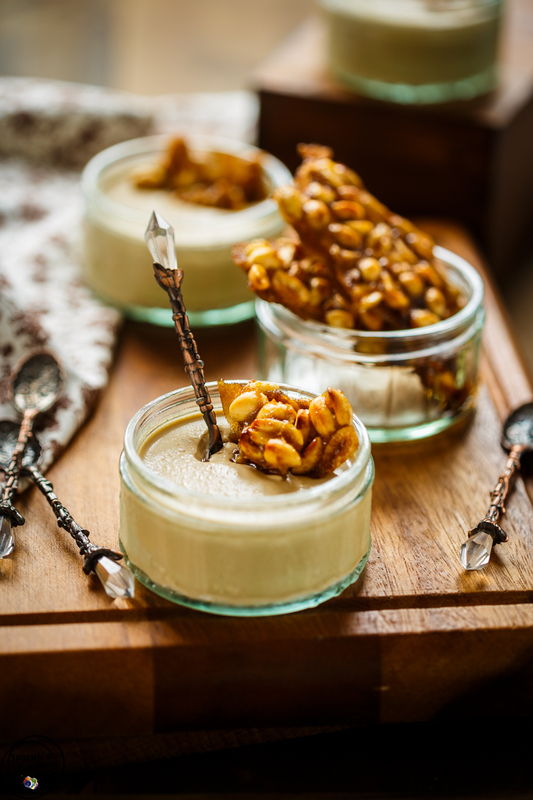 I asked the family if they want to have Caramel Panna Cotta or Vanilla Panna Cotta with Salted Peanut Brittle, secretly I was wishing and had my fingers crossed for Salted Peanut Brittle Panna Cotta, but the family decided to have Caramel Panna Cotta. 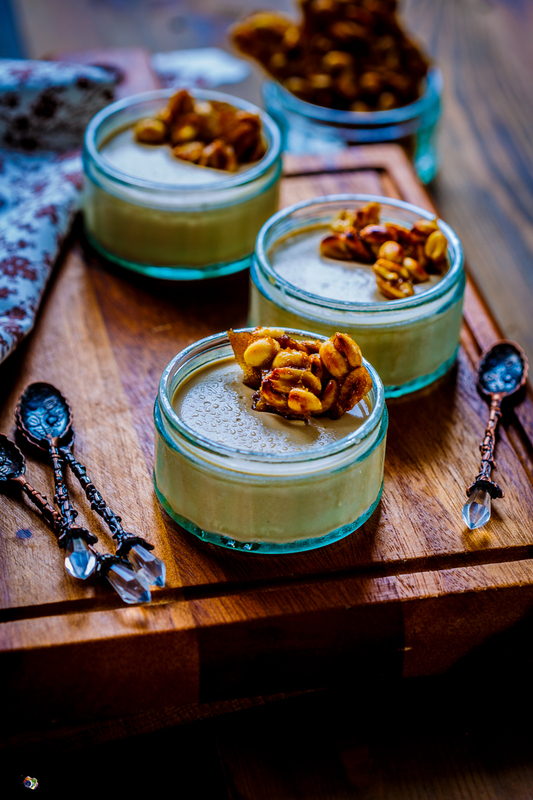 When they asked me I told them about my choice, they were feeling guilty and asked me to make Salted Peanut brittle Panna Cotta, luckily on right time my mind made a right decision, So we had this unexpected sweet treat, Caramel Panna Cotta with salted peanut Brittle. 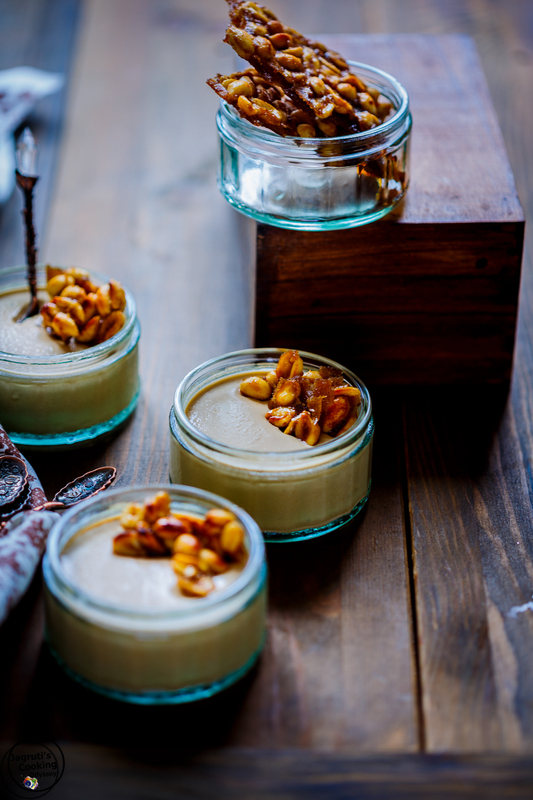 This luscious Caramel Panna Cotta dessert topped with sweet, salty and nutty crunch was absolutely bang on. These creamy little custards make for the perfect Father's day or year-round treat. 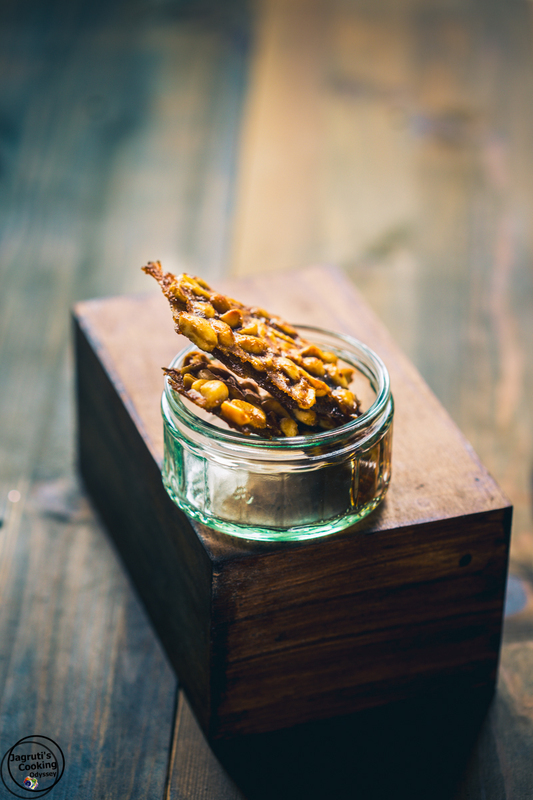 This dessert is super satisfying and very easy to prepare, the salted peanuts brittle is really easy to make too, making brittle is so much fun and can be made relatively quick with my method below. The saltiness and sweetness of the brittle absolutely gorgeous with the caramel custard. These mini treats are to die for and see some hands hovering over the second or third, so make extra! I have used organic coconut sugar in making caramel pannacotta as coconut sugar has naturally caramel flavour. If you do not want to use coconut sugar, use light Muscovado sugar or regular white sugar. The Brittle is also especially good when made with other nuts such as cashew, walnuts or macadamia in place of peanuts. 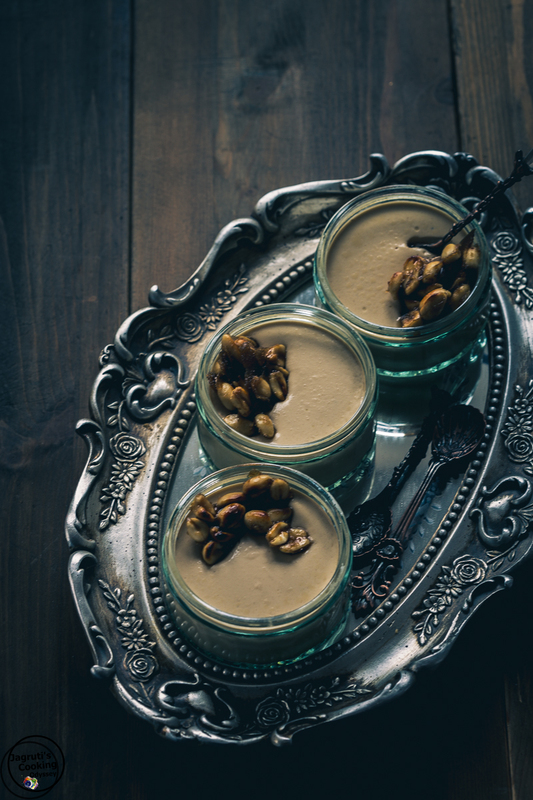 Caramel Panna Cotta with Salted Peanut Brittle is a super satisfying dessert which is perfect for all year-round. The saltiness and sweetness of the Brittle absolutely gorgeous with the Caramel custard. In a pan add the half of the milk and coconut sugar.Whisk it well and let the sugar dissolve properly.Put the pan on a medium heat and allow the mixture to heat up.Cook for further 4-5 minutes, but do not allow to burn.Now add remaining milk, agar-agar powder, cream and maple syrup.Whisk well and let the mixture simmer but do not let it boil.Keep stirring most of the time.Let the mixture cool for 5-7 minutes.Add vanilla extract.Pour the mixture into ramekins or serving bowl or glasses equally and allow to set in the refrigerate until set. Meanwhile, make brittle.Lightly oil a baking sheet or line with baking parchment.In a non-stick pan add sugar and 100ml water.Heat the pan gently, and let the sugar dissolve itself.Once sugar dissolve, gently stir it and bring it to boil.Then boil about 10 minutes until the syrup reaches to a deep amber coloured caramel.Don't let the caramel go darker or the taste will be bitter.Remove the pan from the heat and quickly add the salted peanuts to it.Give it a quick stir and tip the mixture onto baking sheet.Spread it quickly into a thin layer with the spoon or spatula and leave it to harden.Once it hardens break into small pieces.Once pannacotta is ready, top with salted peanut brittle and serve chilled.Enjoy. I think I need to host a dinner party just so I can serve this! Beautiful photos! This sounds so delicious! 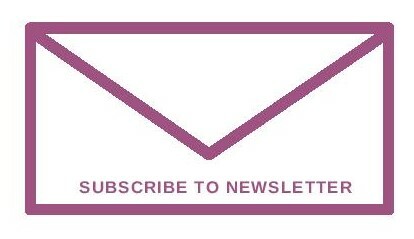 ...especially that peanut brittle, yum! Sounds and looks fancy. Love the props too! This looks perfect for Father's Day or year round like you mentioned. I love the addition of peanut brittle. 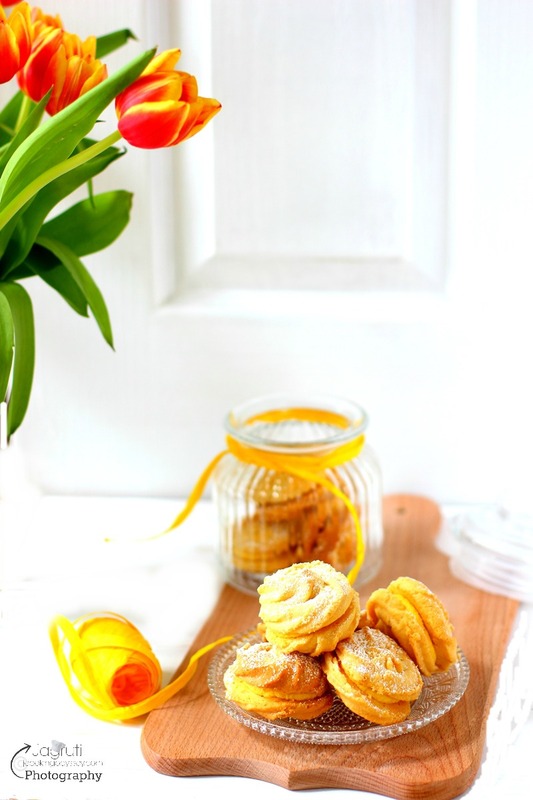 I love caramel so this recipe is perfect for me. I will definitely make it soon. These little pots look exceptionally stylish. I'd be proud to serve them to guests at a dinner party. Oooh Caramel panna cotta sounds amazing! As usual, I am drooling just looking at the pics..you have some skill! Love it. Chikki is my fav and I am pinning this recipe for sure! Thanks Priya, you are too kind :) I am sure you'll love this one. I love sweet and salty desserts! These sound incredible, with the caramel flavor and the peanut brittle. I love sweet and salty desserts! This sounds incredible, with the caramel flavor and the peanut brittle. That salted peanut brittle sounds incredible. I need to try it this weekend. Lovely pic! I love sweet and salty desserts like panna cotta. This is definitely a super elegant dessert. Not only easy to prepare, but you can also make it ahead of time -- I love that! I love a good panna cotta, but OH - that brittle! Seriously - it's the perfect match of smooth and creamy with a crunchy punch! Love this! This looks wonderful! 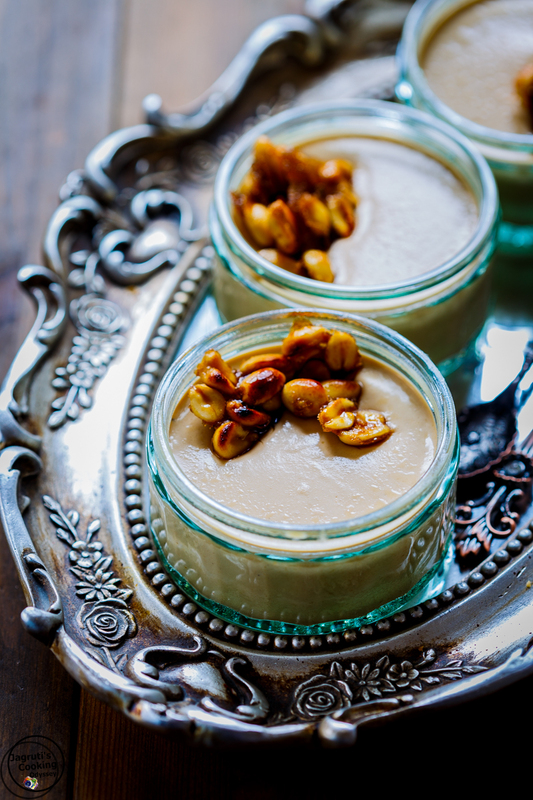 I've yet to make panna cotta with agar agar, but I love the idea of a totally vegetarian version! This panna cotta looks delicious. Like the addition of brittle with it. Such a beautiful looking dessert.. I would think twice before eating it! Scumpticous!